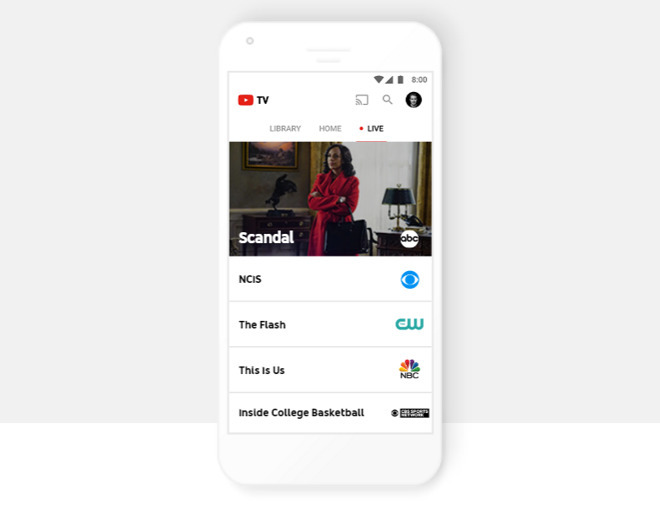 Google on Tuesday announced YouTube TV, a live TV service launching this spring that will compete with other internet-only providers like Sling TV and PlayStation Vue. The base package will cost $35 per month and offer channels from ABC, CBS, NBC, and Fox, among them affiliated ones like Bravo, Syfy, and ESPN, Recode reported. In all the package is expected to include about three dozen options. People won't, however, have access to channels from companies that only operate on pay TV, some examples being AMC and Time Warner. Those companies could be included at later date, according to Recode, but Time Warner executives told the site that it won't be offering the likes of HBO until YouTube signs a deal for its Turner networks. While initial content may be limited, Google says it will be offering cloud DVR functions with unlimited space, something so far reserved for PlayStation Vue. It will also include a recommendation system based on Google AI, and the company is promising "reliability and scalability," likely a jab at services like AT&T's DirecTV Now, which launched with serious glitches. YouTube TV will be separate from YouTube Red and get its own app. Indeed Google is aiming for a "mobile first" strategy, though people will also be able to watch on computers and TVs, for instance using Google's Cast technology. A live TV service From YouTube has been rumored for some time. It will likely go head-to-head this season with a Hulu alternative, which has been promised but not officially announced.